By 500 b.c. 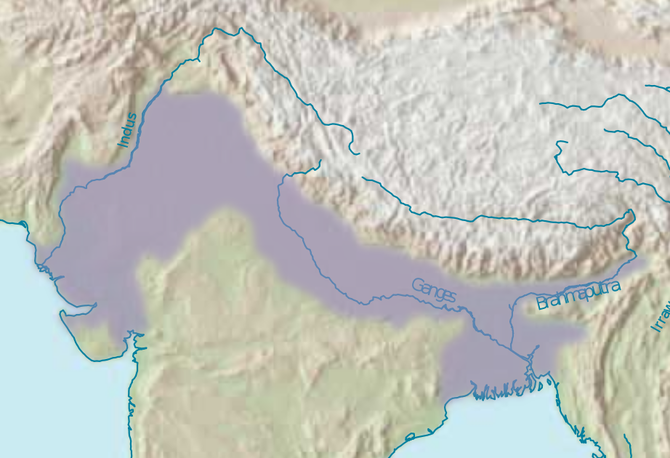 the Ganges Valley had become the center of Indian civilization. The Indo-Aryans had developed a complex religion based on ritual offerings to the gods, and the ancient hymns of the Rig-Veda had become the source of knowledge and power for the Brahmins, or priests. As society grew more complex, this traditional Vedic religion faced challenges. Some people sought more opportunities to participate in religious practices, while others traveled new pathways in their search for truth. By 500 b.c. the basic social structure of India, based on the varnas, or social classes of the Indo-Aryans, had begun to take shape. As time went on, the varna system itself grew more complex. No longer in migration mode, the Indo-Aryan tribes no longer looked primarily to their war leaders and warriors for security. Instead, as they began to settle on the land, they increasingly depended on the rituals of the Brahmins to maintain the natural order on which they believed their lives depended. As a result, the Brahmins soon rose to the top of the varna system, displacing the Kshatriyas, or warriors, to second place. The Vaisyas (merchants, traders, and farmers) and the Sudras (artisans and servants) remained in their earlier positions. At the same time, under the influence of Brahminical conceptions of ritual purity, a new group developed outside the system. These “untouchables,” as they became known, performed jobs that other Indians considered ritually unclean, such as tanning animal skins, which involved working with animal carcasses, or sweeping among the ashes of the cremation grounds – all occupations associated with death and decay. The system became even more complex during the Vedic period when the varna began to divide into jati, or sub-groups. Each jati had its own customs, including different diets, marriage and funeral traditions, and worship practices. The Vedanta and the Upanishads. By the 700s b.c. the Brahmins had become the most influential group in the social structure, and some Indian thinkers were raising questions about Brahminical authority. Many of these thinkers, both men and women, became wanderers who taught their new spiritual message to worthy disciples in the forests of the Ganges plain. This new school of thought was known as the Vedanta, or "end of the Vedas," and was most powerfully expressed in a series of written philosophical dialogues called the Upanishads. “From the unreal lead me to the real! From the darkness lead me to the light! The Upanishads taught that the world and all things in it, including human beings, were part of a single universal being, or Brahma, which is eternal and never changes. Everything that humans observe through their senses, according to the Upanishads, was maya, or illusion. The purpose of life was to see through this illusion and to experience the oneness of Brahma. The epics. The intellectual and philosophical nature of the Vedanta had little appeal for many ordinary Indians. Instead, most Indians found spiritual comfort from another source: epic poetry based on historical and religious themes. The two greatest epics of this tradition were the Mahabharata (MAH-hah-bah-raht-ah) and the Ramayana. Through these entertaining tales, ordinary Indians found lessons of morality and spiritual guidance that they could relate more easily to their daily lives than was possible with the more abstract and intellectual speculations of the Upanishads. The Mahabharata tells the story of a great civil war among royal cousins battling over the legacy of the king's domain. The last 18 chapters of this epic, known as the Bhagavad Gita, or "song of the lord," stress that fulfillment comes through bakhti, or complete love and devotion to god. TheBhagavad Gita made salvation available to everyone. People did not have to perform the sacrifices required by the Rig Veda, nor did they have to live the life of self-denial prescribed by the Upanishads in order to achieve salvation. The Ramayana, or "romance of Rama," tells the story of Rama, an exiled prince, and his faithful wife, Sita. Rama was exiled, then Sita was kidnapped and taken to Ceylon, now Sri Lanka, by a demon. Rama defeated the demon, rescued Sita and became king. Because of their devotion to each other and to their people, Rama and Sita came to symbolize the ideals of Indian manhood and womanhood, and their struggles to survive and prosper. Out of all this ferment of ideas and literature, from the Vedic texts through the popular epics, developed the predominant Indian religious system that we know as Hinduism. Combining elements of both Aryan and pre-Aryan religion, Hinduism represented a synthesis of Indian religious cultures and recognized many gods—most notably Brahma the Creator, Vishnu the Preserver, and Siva the Destroyer. At the same time, reflecting the philosophical principles of the Vedanta, Hinduism also taught that all gods and living beings are representations of a single universal spirit, Brahma—a doctrine called monism. The three most important concepts of Hindu belief are reincarnation, dharma, and karma. According to these doctrines, when people die their souls are reborn in new bodies, a process popularly known as reincarnation. During each cycle of reincarnation, people must fulfill a moral duty, called dharma, which depends upon the social class and position into which they are born. The actions that people take during their lifetimes have moral consequences, called karma,which determine the next cycle of reincarnation. People who fulfill their dharma are reborn into a higher caste. Those who do not fulfill their dharma are reborn into a lower caste or even as an animal or insect. According to Hinduism, people who consistently fulfill their dharma may eventually break the cycle of birth and rebirth, and realize their true oneness with the universal spirit, Brahma. As Hinduism incorporated many different beliefs, many religious offshoots developed. The two most important were Jainism and Buddhism. These two movements arose as a reaction to the religious beliefs of the Brahmins. It is perhaps not surprising that these movements came out of the warrior class, which stood beneath the Brahmins in Indian society and often resented the great influence of the Brahmins. This belief in nonviolence is called ahimsa. Mahavira also believed in living a life of deliberate self-denial for religious purposes. He apparently had such remarkable powers of self-control that his followers called him jina, or conqueror. Mahavira and his followers turned away from Vedic religion, in part because of the Brahmins' use of animal sacrifice, and established a religious sect that later became known as Jainism. The Jains believed that everything had a spirit; therefore, unlike the Hindus, they do not believe in a universal spirit. They apply the law of ahimsa toward life at every level. They are vegetarians and cover their noses with a cloth to avoid breathing in—thereby destroying—insects. Because they avoid occupations such as farming in which they may harm living things, many Jains worked as merchants. Buddhism. As Jainism was taking shape, another spiritual philosophy of even greater impact was developing in India. This was the philosophy of Buddhism, whose founder, Siddhartha Gautama, became known as the Buddha, the "Enlightened One." According to Buddhist traditions, Gautama was born the son of a prince in northern India about 563 b.c.. As a youth, he lived a luxurious life, shielded from the world's suffering. At age 29, however, he ventured out of his palace and learned about hunger, disease, and death. Vowing to discover the reasons for this suffering, Gautama renounced his family and possessions and set out in search of the truth. Like the Upanishadic teachers, Gautama wandered for six years through the woods of Kosala and Magadha. Living as a hermit, he fasted and practiced meditation in search of answers. Finally, after six years of searching, while meditating under a tree Gautama suddenly achieved what he had been searching for - a state of complete inner peace and understanding of the nature of all things - enlightenment. He became known as the Buddha. Gautama spent the rest of his life teaching his insight and his philosophy of life to others until his death around 483 b.c. Some of the Buddha's beliefs were revolutionary to Indian society. For example, he rejected the rigid nature of the varna system. As Buddhism spread, it divided into two main branches. The first, called Theravada or "way of the elders," recognized the Buddha as a great teacher and retained the Buddha's original teachings. The second branch, called Mahayana or "greater vehicle," turned Buddhism into an organized religion, with priests, temples, and rituals. Eventually, Buddhism spread to many other parts of Asia.